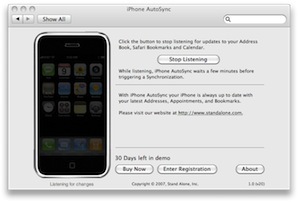 After two months of work we recently put the finishing touches on our first ‘real’ Mac product: iPhone AutoSync. Out of the box, the iPhone does a great job of synchronizing with the Mac’s built in PIM applications, Address Book and iCal, and bookmarks, courtesy of Safari. After years of somewhat kludged together sync solutions on the Palm and Windows Mobile (at least on the Mac side of the fence), the iPhone feels great. One thing quickly becomes apparent, however: after editing a friend’s number in Address Book, I finished a few things, grabbed my phone, and was out the door. When I went to call him, I noticed that my recent edit was not reflected on the iPhone. As it turns out, the iPhone syncs only when it’s placed into its dock (or, manually, when you right-click on it in iTunes and select “Update”). Any changes you make between docking and undocking, however, are lost. Since my phone spends most of its time in the dock, these have to wait until the next time I come back to my computer.Enter iPhone AutoSync! iPhone AutoSync monitors your three synced applications, and, when changes are made, makes a note. After a few minutes, if no more changes have been made, it triggers a sync with your phone. Thus all your information in up to date in both places, pretty much all the time. Warning: Here there be geekery. Skip past if you're not interested in the behind-the-secenes. The main challenge when writing a faceless app is to minimize resource usage. Since iPhone AutoSync is always running, we don’t want to hog too much memory, processor time, or other system resources. However, we also want to make sure we are responsive, and the user doesn’t have to wait too long for us to kick in.Our first attempt used kqueues. Mark Dalrymple and Aaron Hillegass’s wonderful book, Advanced Mac OS X Programming has a great set of examples making use of kqueues. In a nutshell, a kqueue will allow you (among other things; they’re very powerful) to watch a directory for changes. When any application reads or modifies files at that path, your application gets notified. Pretty much just the ticket, right? As it turns out, we were using far too big a hammer here. On a tip from Dave Nanian, we grabbed Notification Watcher, and found that each time you edit an Address Book entry, or modify an iCal event, a series of global notifications gets sent. By listening for those, we were able to find out each time the user’s data is modified, in a much lighter-weight system than kqueue.iPhone AutoSync has a giant bottle-neck, however, and that’s iTunes. Since we keep close watch on our target applications, we could immediately sync the phone each time they change. However, a sync is a relatively expensive operation: we don’t want the user’s iTunes hogging CPU and changing its UI every 30 seconds as they plan out their week’s schedule. The answer here was an aggregator: each time a change event occurs, we set (or reset) a timer. Once no change events have fired for a few minutes, we assume the user has finished editing, and fire the sync. This meant that there would be a slight delay between a change and the iPhone being totally up-to-date, but after a bit of experimentation, we think we’ve found the right mixture between the two extremes. We’ve been meaning to start a blog for a while, this seemed like a good excuse: over the weekend, I entered the Iron Coder contest and won! Iron Coder is based on the Iron Chef concept: you’re given an area of the operating system to work in (in this case the Screen Saver framework), and a theme (here it was “Life”). With those two constraints, you’ve got two days to put something, anything, together. 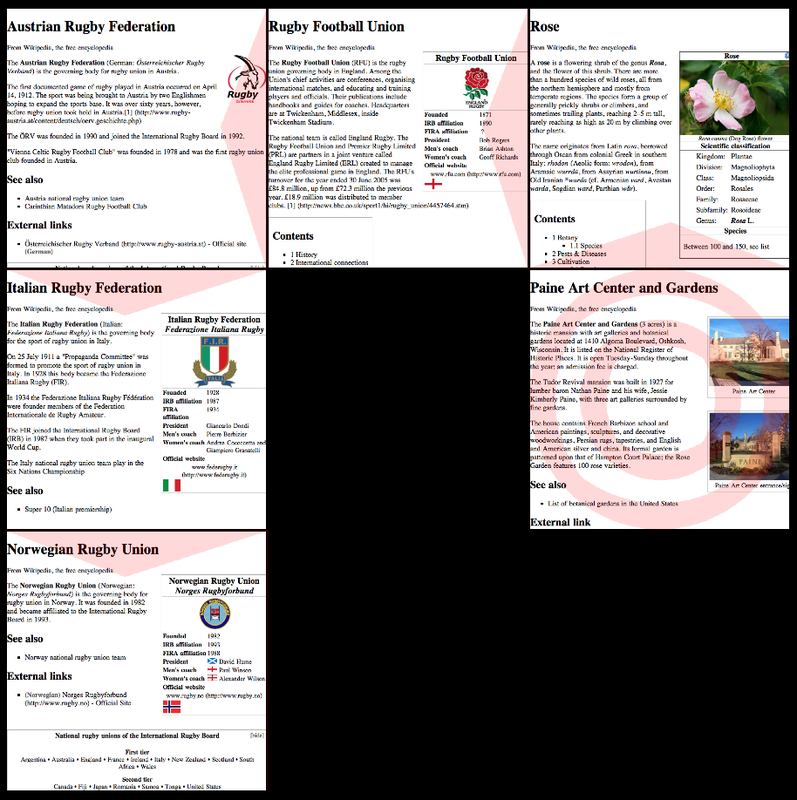 With the work we’ve done on Quickipedia, I’ve developed a familiarity with Wikipedia and its layout, so some sort of Wiki-based screen saver seemed a good place to start. One of my favorite features of Wikipedia is its ‘Random Article’ function. I like to request a random article, and then follow its links, picking up odd bits of knowledge along the way. I figured I could recreate this sort of ‘random walk’ in a screen saver. Wikipath starts with a random Wikipedia page, and draws a portion of it on screen. It then randomly jumps to one of the wiki-links on that page, and draws it next to the original. It keeps this up until it hits a dead end page or runs out of room, then it starts over. Finally it was just a matter of adding a few (primitive) graphics so that you could visually follow the page as it wends its way around your screen, and at the end the visual impact I was able to get was amazing. The upshot of all this is I won a free to ticket to C4, Jonathan ‘Wolf’ Rentzsch’s awesome Mac development conference, hosted right here in Chicago. In addition, I inherit the judging duties for the next Iron Coder, which promises to be an adventure. Many thanks to the Judge of Iron Coder V, Jonathan Wight. I think there were nearly twice as many entries as the previous contest, and Jon put in a lot of time evaluating ’em. Check out some of the other great screen savers and applications! Wikipath isn’t done yet. Right now I’m working on the ability to select a page that strikes your fancy, and jump to that in your web browser. Hopefully I’ll have that up and running over the weekend. A couple of optimizations are also planned, so it’ll run a bit more smoothly and not hog all the processor. Stay tuned! You are currently browsing the archives for the Mac category.